As I have already remarked, the deputation that had gone to Kutayah had actually been arrested. The wording in the sense you are aware of had been dictated to them. I knew before the deputation left what would happen; that is why I had Kiasim Pasha, who by chance sat on my left hand during the interview, given to understand that he must not go, although Reshid Bey insisted that he should accompany him. For, if they kept Kiasim Pasha under arrest, not temporally but permanently, they could gain great advantage by the use of his signature. “I send you herewith the exact wording of the telegram sent by the deputation that went to Kutayah. I beg you to forward a sum marised account of the most essential points telegraphically to Refet Bey and Fahreddin Bey. “The telegraphic reply which I had sent personally to the depu tation was simply this: ( I shall submit your telegram to the Council of Ministers to-morrow. Following the resolution of the Council of Ministers I shall inform the deputation to-morrow that their mission is fulfilled and that they shall return to Angora as soon as possible. Then I intend to explain the matter in detail to the Assembly. I re quest Ismet Bey and Refet Bey to keep their troops where they are concentrated and ready for action against the flying columns and to pay more attention to the general dispositions that have been decided upon. 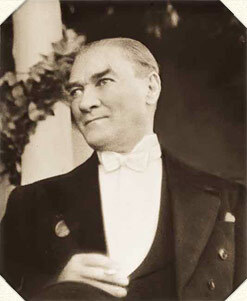 Mustapha Kemal, President of the Grand National Assembly. In cipher. 27 ttL December, 1920. Salih, Chief of the Intelligence Department. 1. The I st Flying Column must obey the laws of the Grand National Assembly and the regulations and orders of the Government unreservedly and unconditionally, and must submit to military dis cipline in the same manner as the other troops. 2. The suggestions and observations concerning the fulfilment of military obligations and the affairs of the command of the I st Flying Column are exclusively under the authority of the command under whom they serve and through this command of the other competent authorities. Kutayah, 28 th December, 1920. To the President of the Grand National Assembly, Angora. We considered your telegram containing the resolution of the Council of Ministers yesterday. We have all come here in full sincerity in obedience to your commands for the salvation of the country and nation. We have convinced ourselves about the state of affairs here and at Eski-Shehr from what we have seen. We have examined the question in dispute impartially and in a spirit of perfect justice. We have explained to you the stages and development of the negotiations as they took place and have written to you as to how in our honest conviction a solution would be possible. From what we have written it is impossible for us to under stand what the resolution of which we have been informed can mean. On the contrary, we observe that our report, which was intended to secure the salvation and welfare of our country, has not been inter preted in a favourable light. We beg you to understand that the question will not admit of being further prolonged. In cipher. At the instrument. To Djelal Bey, Reshid, Ejub Sabri Bey, Wehbi Bey, Kilidj Ali Bey, Members of the National Assembly, Kutayah. Reply to your telegram in cipher of the 28 th December, 1920. The cordial interest which you take in the salvation of our country and nation fills me with gratitude. I had officially brought the question before the Government be fore you left, and after having given you instructions and shown you the documents I asked you to take the trouble to undertake this journey for the purpose of explaining to our comrades in that part of the country what the guiding lines are that they should follow. Moreover, the resolution of the Council of Ministers contains once more in a definite official form the points which are well known and which it is everybody s duty to obey. Your communications have not in any way been unfavourably interpreted. It only shows me as I have also maintained here that my perfectly sincere efforts and the personal and private steps I have undertaken for the last month and a half have, unfortunately, not been appreciated. This has compelled me to delegate the duty of considering and trying to solve this question to competent and responsible authorities. After I had communicated the resolution of the Council of Ministers to Kutayah and informed the deputation that they were to return, I ordered the commanders at the fronts to proceed simultaneously against the mutineers Edhem and his brothers.